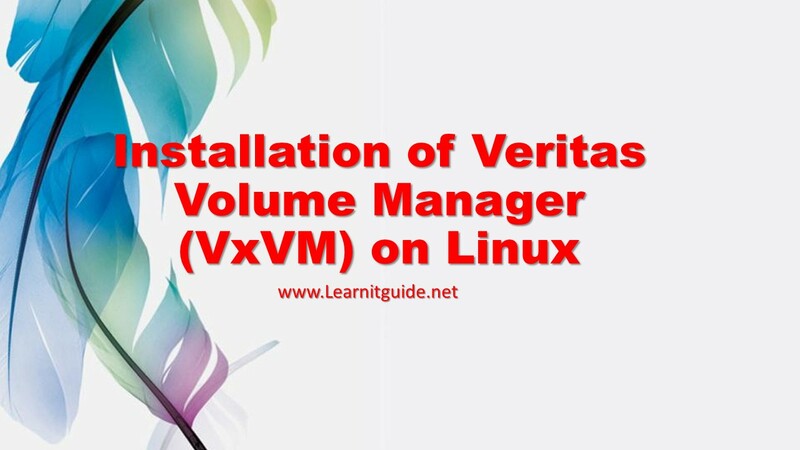 This article shows you how to install the Veritas Volume Manager (VxVM) on linux. The Veritas Volume Manager (VVM or VxVM) is a proprietary logical volume manager from Veritas and now its with Symantec. 2. Extracting the Installer Package. 1. Download Symantec Storage Foundation Basic 6.2 from symantec.com. Go to Symantec.com website and Signup free to download the Symantec Storage Foundation Basic 6.2 for linux or click here for the direct link to download. 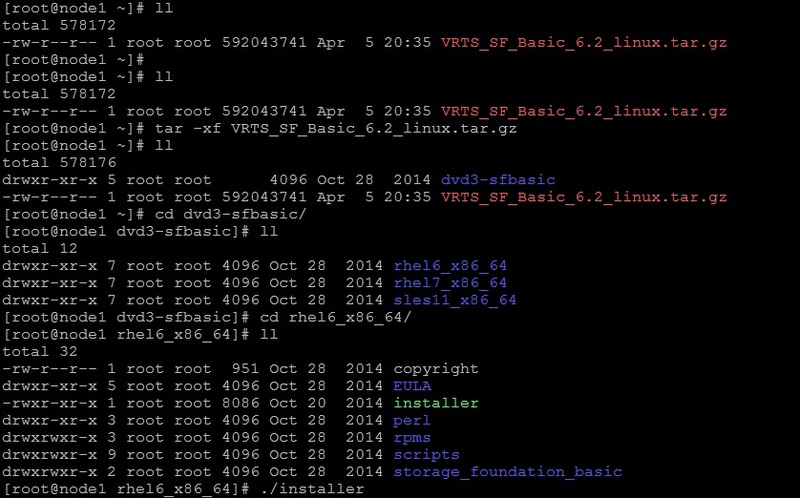 I have copied the downloaded file VRTS_SF_Basic_6.2_linux.tar.gz into the server node1 under /root. Extract the downloaded package and run the installer as shown in the image. Note : If you get an error as "Cannot find perl to execute", just move the "bin", "lib" folder from perl/RHEL6x8664/ to perl directory, because installer looking the perl files under perl folder, but it placed on perl/RHEL6x8664/. You will get the prompt with many options as shown in the image. Press "I" and enter to select Install a Product. Press "y" to say yes for the terms and conditions. Press "2" to install the recommended rpms. Enter the System Name, here we had given "node1". Once we enter the system name, installer will do some checking and will give you the status at the last column. Sometime it may report you as failed because of missing rpms and also that will give you an another option to install via yum or manually. If you have yum server then select "1" to install the missing required rpms with yum. Please refer this link to configure the yum server. 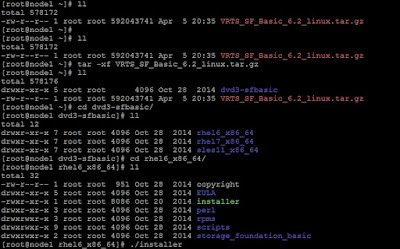 Even if you are getting the errors as rpms are missing and failed to install with yum. Try the below solution because sometime it may fail for keys and below solution was helped me to fix it. Again start the installer and check. If that solution didnt helped, try to download the rpms manually and run the installer again. Once everything is finished, just "Enter" to continue. 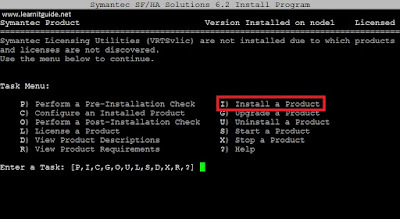 Again installer will start checking the system and will ask you to "Enter" to continue installing the Symantec Storage Foundation Basic 6.2 rpms. After few minutes, you could see the messages as Symantec Storage Foundation Basic installation is completed successfully as shown in the below image. Thats all about Installation of Veritas volume manager and veritas filesystem using Symantec Storage Foundation Basic 6.2. Also refer this link to manage the Veritas Volume Manager to create a diskgroup and volumes. Thanks for reading our post. share with your friends. We appreciate your feedback, Leave your comments if any. We have more articles to be updated soon. To not miss any updates, Follow us on social networking sites and Subscribe us on our Youtube channel.